I tend to buy things that I like without knowing what I’ll do with them. Then they sit and wait for me to use them for a project. Budget Décor is easy for me because of that. I put together this little piece of art using materials I had saved for some project, not knowing what that project would be. 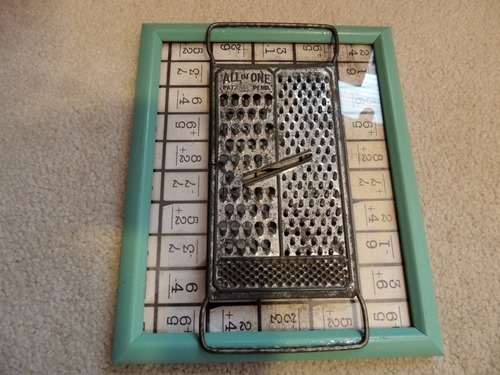 The cheese grater was from an estate sale and cost $2. The frame was from a thrift shop and cost $0.50. The paper was from Archivers. I am not sure how much it cost, so I’m estimating $1. Total = $3.50. I cut the paper to size – and accidentally cut it the wrong orientation – I’d meant to have the equations vertical, not horizontal! I framed it anyway. 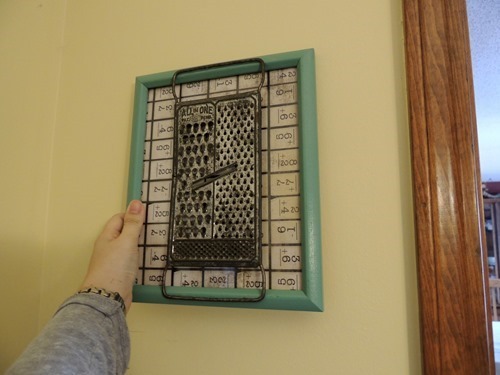 Then I glued the cheese grater to the frame. Here is where I would like to hang my new art piece, in my kitchen. I can’t find the hammer. Also I probably shouldn’t be hammering anyway. But you get the idea. 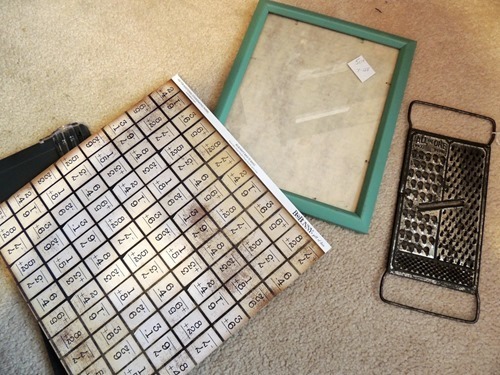 The Craft Challenge this month was actually to make something gorgeous for less than $10. Less than $10? Yes. Gorgeous? I’m not so sure! It’s definitely unique though, and that’s what makes me happy!